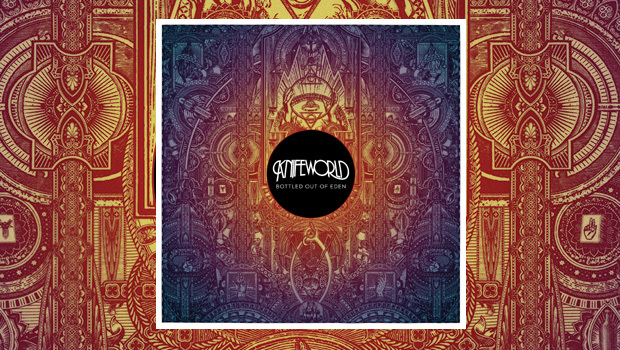 Although loosely tied in with the prog genre, Knifeworld are a band who make genuinely progressive music, thereby bucking an all too common trend where many musical collectives and their comfy audiences revel in looking backwards at bands who were looking forwards. It is safe to say that Knifeworld’s influences are not of the standard variety. Inheriting a zest for life in their tunes from main man Kavus Torabi’s voracious nature, not to mention his tenure with Cardiacs, they also share that unique band’s boundless sense of adventure. However, any direct comparison to Tim Smith’s headstrong group is moot, as Knifeworld, now three albums old, have carved out their own distinctive place in the cutlery drawer. Early concerns about the sound quality of my low-res review copy were not totally allayed by the files that followed, but thankfully it was discovered that the WAV files I had been sent contained mixes intended for streaming, the modern day equivalent of the wax cylinder. The actual CD mix is the business, as it should be with Bob Drake at the controls, the legendary go-to mixer of choice for the left-field band. The album was recorded at Bob’s abode in the highly conducive setting of the Pyrenees, and the lowdown on that and other album-related queries can be found in my interview with Knifeworld’s keyboard player Emmett Elvin which you can read HERE . Arising out of far-flung cosmic debris and borne on solar winds directly traversing the length of your vestibulocochlear nerve right into the heart of your mainframe, the creeping drones supplied by mischievous Pyrenean pixie Maxence Dels Aucells slowly seep into your skull and take over your thought processes in the manner of a mildly psychotropic drug, and album promo track (is there such a thing as a “single” any longer?) High Aflame, available out there in YouTube land for some time now, leaves the pull of Earth’s gravity and takes it with you for the first of an eleven part journey to distant galaxies. Hyperbole aside, what Knifeworld do is combine magic and communication to forge something different to the average fare we are often submerged in these days. 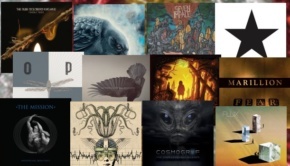 You will find no over-familiar generic riffing or obvious classic prog tropes here. What they do relays tautology by musical semaphore, and sounds new and fresh without ever being forced, or arch, or contrived. 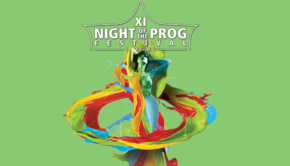 The problem with that is that it will doubtless alienate half the “prog” audience for the very same reason. 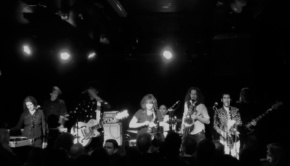 I doubt Knifeworld care somehow, as I have witnessed them give their all in front of an audience of a mere 20 enlightened souls on a mini tour to launch their previous album, the rather spiffing The Unravelling. They obviously deserve better, and I hope they have not shot themselves in the collective foot by returning to that same venue (The Musician, Leicester, 9th May) for the first gig of a short tour to launch Bottled Out Of Eden, and on a Monday night, too! They don’t make it easy on themselves do they? Come along if you’re within distance, it will be a blast. Anyway, back to the task in hand. After that energetic opening salvo the album leaves mundane concerns far behind and takes on a more hope-tinged outlook than The Unravelling’s bleak premise, this time seeing hope arising from loss. Kavus’ unaffected vocals are often in tandem with Melanie Woods and so never become wearing, as his limitations may have done had he sung every song solo. The dual vocals weave another layer of sound along with the many other instrumental shenanigans going down here. Melanie also gets to sing solo on I Am Lost, which features a sinuous horn arrangement that winds on through the song as if the thick lustrous windblown hair of a motorcycle girl, eventually becoming becalmed before the song resolves with a rearrangement of the original theme, assisted by Emmett Elvin’s filmic synth guiding the closing credits. A staple of the recognisable Knifeworld sound, the sax and woodwind section serve as a psychedelic R&B chamber orchestra, punctuating the music in a similar manner, but from a completely different perspective, to the brass section on a Stax record. If you want parping freeform sax workouts, go listen to some jazz fusion, as solos as such from brass or any other instrument are absent from this album, and in their stead the intricate arrangements and locked-in ensemble playing create the distinctive atmosphere. Scattered through the record are occasional short instrumental breaks rather than solos, one of which occurs on opening track High Aflame when Professor Elvin chucks in a fantastically cheesy but somehow appropriate synth line that had me imagining the keyboard scientist grinning like a loon while playing it. As Emmett explains “I told Kavus I had a melody that sounded like it belonged in an ’80s kids’ game show and he’d probably hate it. He loved it. What can you do?” Indeed, just go with the flow and bow to the inevitable! More intricate reed work punctuates the eerie The Deathless, a dry land sea shanty musing on mortality that alternately creeps and lurches, gaudy snakes entwining the eye sockets of this cracked skull of a song. Marvellous stuff! As the album progresses it is apparent that the early air of hope is subsumed by dark arts and magick and decay. The Foul Temple is both internal and extant, it all crumbles away. Some wonderfully angular guitar work presages I Must Set Fire To Your Portrait, evidence of consummate skill in the arrangement department, as the band lock in to the groove negotiating the odd meter while the lyric reprises the rebirth theme of High Aflame. Although only five and a half minutes long, this song is as epic as any meandering twenty minuter, andasconciseasthis. This band can say more in one song than some manage in entire albums. Keeping all this together is the unobtrusive but direct rhythm section of Charlie Cawood’s bass and Ben Woollacott’s drums. Their solid and unfussy nature is given more of a head on the flamenco from hell that is Lowered Into Necromancy, a tune that ends by diverting into cinematic territory with Emmett’s sweeping string synths as Kavus intones “Come to life, in your story, In your life, give me glory”. There isn’t a dry eye in the house. Like I said Knifeworld are full of ideas, and better than that have the experience and chops to realise them. Listening to this for the umpteenth time it occurs to me how Bottled Out Of Eden keeps on revealing, much like a blooming spring flower. It took me a few listens before I got past the more “instant” tunes on the record, but it has been a trip worth taking I can tell you. A trip where the protagonist who has lost finds redemption in hope. A Dream About A Dream sees us back on the Road of Hope, and a lovely passage from the reeds section lifts the tune into a sunrise that leaves melancholy behind, all rather glorious. The concluding two songs continue this uplift, and Secret Words has the righteous feel of one of Townshend’s best low-key numbers, with a hint of a Seeker-like riff making a fleeting appearance. Feel The Sorcery is handclap magic on a farmboy’s wages, that balances a boppy tune with a world-weary lyric; “All the magic, all the loss, how could we break the spell? I can’t believe we walked right out of Eden unto Hell”. It is a fine slice of pop with which to end an ambitious album that while definitely complex never gets lost in trickery, and more to the point is a musical and lyrical success. You can’t ask for much more than that, can you?